This precision product is designed to adapt your FOCUS bike with your indoor trainer. 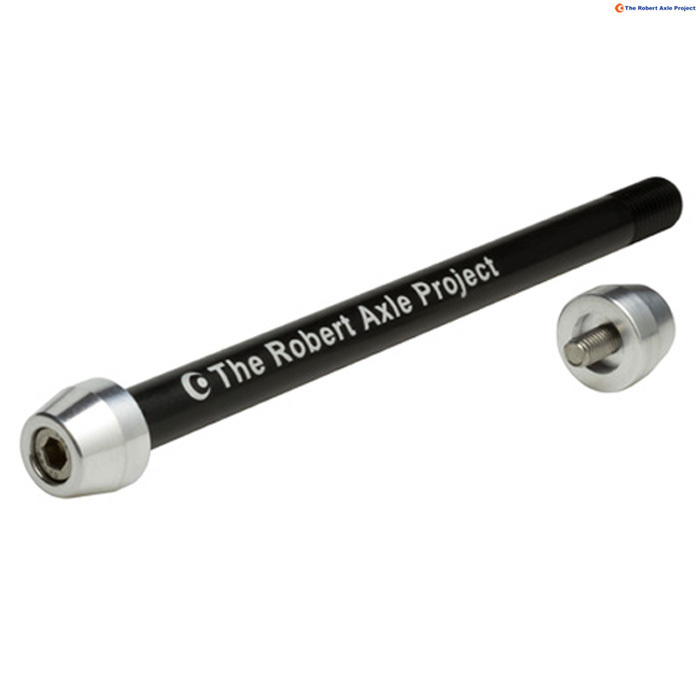 Robert Axle for Trainers replaces your stock axle in your 12mm thru-axle equipped bike. The axles are designed for maximum strength and ease of use. This axle includes a special nut for adaptation with Focus bikes with the RAT thru axle system. You will need to remove the Focus RAT nut from your bike and replace it with the nut that is provided. - This axle is compatible with resistance trainers and Focus bikes with the RAT thru axle system. - This axle is compatible with 1up, Blackburn, Cyclops, Kinetic, Tacx and more. - The true dimensions of the axle shaft are: 12mm diameter x 172mm length with 1.5mm thread pitch. - The axle shaft and axle ends are precision CNC machined from 7075 aluminum and hard anodized for rugged durability. - No special tools required. Design allows for installation or wheel removal using your standard 5mm hex wrench. This was just the item i had been trawling the web looking for. I very simple swap of an end cap nut section with the supplied replacement part, slot the axle through the well, tighten and you are ready to mount to a wheel on trainer. I needed to replace a Focus RAT axle damaged after a fall. Impossible to find a new RAT system axle and discovered these after a search online. Well made, sturdy and attractive. This one part helped turn an insurance write off into a very useable (second) bike. Brilliant service from both Robert Axle Project (USA) and SJS Cycles. Can I use or adapt this for elite novo/quado style wheel on trainers? The elite trains use quick release clamps which fit on one side, so can this unit be used but adapted with a quick release style clamp 'head' at all? Or will it work fine regardless? This will be fine for use on an Elite Novo, Worldwide shipping is available! This should work absolutely fine, however as we have never done this we cannot say for certain. SKU: TRA204.F - the same? the picture show some extra items eg. a replacement R.A.T. not - The SKUno. is the same. Will I recieve "the full package", if I order at our webshop? Yes all the parts are included. Will this work with my Focus Mares AX Tiagra CX bike? If your bike uses the RAT axle system and is 142mm x 12mm then this will work. Will this work with a JetBlack S1 Sport Turbo Trainer? There should not be a problem, but we have not tested this ourselves so could not confirm it is 100% compatible.